Ayant de trop parler tout le corps alteré. Quand ton vaisseau se voit de ta lévre honoré. Le garde en sa rondeur comme en une fournaise. Seulement au toucher je l’ay bien apperceu. Quand je sens contre moy l’eau se tourner en feu ? Having withered my whole body with talking too much. When your vessel was honoured by your lips. Guarded it within his bowl as in a furnace. Just touching him, I readily felt it. When I feel water itself turning against me and into fire? Blanchemain has “comme” for “comment” in line 13 (no impact on meaning; and I think “comme” runs better in the line?). He does however have a more substantial variant in the opening stanza: again, I think I prefer the variety of the ealrier version to the more prosaic newer version. Et m’appelez, honteuse, amant presomptueux. Qui ne me soit au cœur la pointe d’un poignart. And shame-faced call me a presumptuous lover. Which is not like the point of a dagger in my heart. No variants in Blanchemain: a perfect poem?! Note that, in line 13, I have translated ‘langue’ as words, trying to retain some of the ambiguities of ‘langue’ – her tongue, her words, her (use of) language; though in fact the tranlsation is flat & dull. Pick your own substitute! Pourquoy me caches-tu l’œil par qui tu me plais ? Ton œil qui me nourrit par le trait de ses rais. De l’Antre où j’ay chanté tant de divers accords. Car je ne suis plus rien qu’un fantôme sans corps. Why do you hide from me those eyes by which you please me? Your eyes which feed me through the sting of their rays. To the cave where I sang so many varying songs. For I am no longer anything but a ghost without a body. I like this poem: it’s very tightly-knit, and the last 2 lines (while still providing a sting in the tail) are so closely integrated. Nicolas Richelet comments (as transmitted by Blanchemain) that Hercueil is Arcueil, a village ‘near’ Paris – now a commune in the southern part of the city. He adds that ‘the cave’ is the grotto at Meudon (now in SW Paris) and the ‘varying songs’ Ronsard composed there are the Eclogues. Blanchemain’s text varies only slightly from Marty-Laveaux’s; but 2 of the 3 lines with small changes he also prints in radically-different form in footnotes. The minor variants are, in line 8, “par l’objet de ses rais” (‘through the property of their rays‘); and in line 13 “Dans ton coche” (no change in meaning); the more radical changes are printed below in another full version of the poem which also includes his 3rd minor change, in the opening line. Dont la vive vertu me norrit de ses rais. Whose lively virtue feeds me with its rays. Mon don pour le Soleil est digne d’estre aimé. Depend de ta vertu, dont je suis animé. Que te puis-je donner sinon que le Soleil ? My gift is worthy of being loved for the sun’s sake. Depends on your virtue, by which I am given life. What can I give you except the sun? Another poem unchanged from its earlier version. Pasithea is one of the Graces, married to Somnus god of sleep, and a symbol of relaxation and calm. Why ‘the symbol of the sun is imprinted going like a crayfish, backward” in an agate I am not sure: perhaps because the agate is dark in the middle and brightens as you move outwards? Tout franc de passion, fuyant le nom d’aimer. Rusé je ne voulois dans les rets m’enfermer. Ton œil vaut un combat de dix ans d’Ilion. Sois douce à qui te prie, imitant le Lion. La foudre abat les monts, non les petites herbes. Entirely free from passion, avoiding the very word ‘love’. Craftily, I didn’t wish to shut myself up in their nets. Your eyes are worth ten years’ war at Troy. Be sweet to him who begs you, imitating the lion. Thunder flattens mountains, not small plants. A rather lovely poem, I think! The ‘ten tears war’ is of course the Trojan War of the Iliad etc. 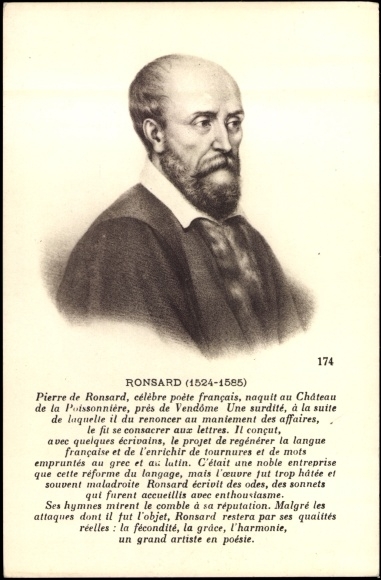 In the previous line note that ROnsard has not just lost the battle, even his camp has been overrun – a very thorough defeat. Seule Phenix d’honneur, qui les ames resveille. Amour enfant comme elle alaicta sa pareille. Qui m’est cent fois plus cher que celuy de ma vie. The only Phoenix in honour, who awakens souls. Love, a child like her, fed her milk as his equal. Which is to me a hundred times dearer than that of my own birth. Line 4 is problematical (to me at least): ‘the only Phoenix in honour’? The phoenix is associated with renewal rather than honour; I assume that here Ronsard alludes to its continuing youthfulness (via renewal in fire), and also to the continually-renewed ‘honour’ of Helen seen in all her actions continuously. Qui vit comme un Phenix, au monde sans pareille. Puis Amour la nourrit des douceurs d’une Abeille. Who lives like a Phoenix, without equal in the world. Then Love fed her with the sweetness of the bees.